Start off your visit on the 22nd (Fri): don't miss a visit to Puerta del Sol. Get ready for a full day of sightseeing on the next day: admire the landmark architecture of Retiro Park, then examine the collection at Prado National Museum, and then admire the masterpieces at Museo Nacional Centro de Arte Reina Sofia. To see ratings, maps, reviews, and more tourist information, refer to the Madrid tour itinerary planning app . Alexandria, Egypt to Madrid is an approximately 9-hour flight. You can also do a combination of bus and flight; or drive. The time zone difference when traveling from Alexandria to Madrid is minus 1 hour. Expect slightly colder temperatures when traveling from Alexandria in March; daily highs in Madrid reach 17°C and lows reach 5°C. Wrap up your sightseeing on the 24th (Sun) to allow time to take a train to Seville. 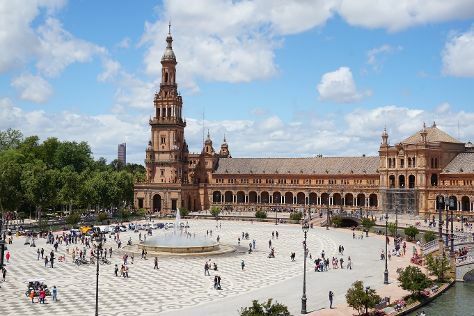 Kick off your visit on the 25th (Mon): take in nature's colorful creations at Royal Alcázar of Seville, awaken your taste buds at some of the top wineries in the area, and then admire the striking features of Plaza de España. Get ready for a full day of sightseeing on the 26th (Tue): brush up on your military savvy at Torre del Oro, admire the masterpieces at Museum of Fine Arts, Sevilla, then take a stroll through Barrio Santa Cruz, then enjoy breathtaking views from Torre Giralda, and finally take some stellar pictures from Catedral de Sevilla. For photos, more things to do, ratings, and more tourist information, use the Seville trip website . You can take a train from Madrid to Seville in 3 hours. Alternatively, you can fly; or drive. Traveling from Madrid in March, expect Seville to be somewhat warmer, temps between 21°C and 9°C. Finish your sightseeing early on the 26th (Tue) so you can travel to Barcelona. Barcelona is known for parks, nightlife, museums, shopping, and fun & games. Your plan includes some of its best attractions: admire the striking features of Basilica of the Sagrada Familia, admire all the interesting features of Camp Nou, see the interesting displays at Casa Mila - La Pedrera, and stroll around Parc Guell. To find traveler tips, reviews, other places to visit, and tourist information, read Barcelona holiday builder app . Traveling by flight from Seville to Barcelona takes 3.5 hours. Alternatively, you can take a train; or drive. In March, plan for daily highs up to 19°C, and evening lows to 9°C. On the 29th (Fri), wrap the sightseeing up by early afternoon so you can travel back home.